Halakist and liturgist; lived about 1220. He was born in Metz, where he attended the rabbinical school, and was one of the best-known German Talmudic scholars. His teachers were his father, Baruch ben Samuel, the well-known poet and halakist, and Eliezer b. Samuel of Metz. He was himself the teacher of Meïr of Rothenburg, to whom he must have been related, since he is cited by Meïr as "my revered relative." He was in correspondence with Eliezer ben Joel ha-Levi, Simḥah of Speirs, and Isaac ben Moses of Vienna. 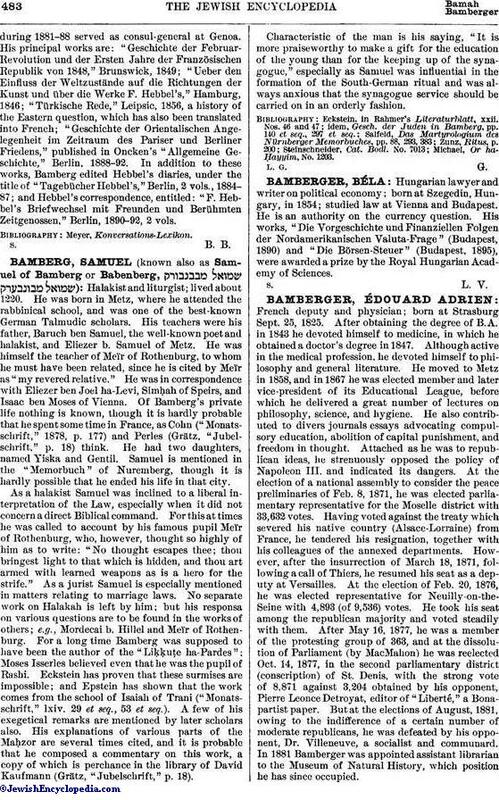 Of Bamberg's private life nothing is known, though it is hardly probable that he spent some time in France, as Cohn ("Monatsschrift," 1878, p. 177) and Perles (Grätz, "Jubelschrift," p. 18) think. He had two daughters, named Yiska and Gentil. Samuel is mentioned in the "Memorbuch" of Nuremberg, though it is hardly possible that he ended his life in that city. As a halakist Samuel was inclined to a liberal interpretation of the Law, especially when it did not concern a direct Biblical command. For this at times he was called to account by his famous pupil Meïr of Rothenburg, who, however, thought so highly of him as to write: "No thought escapes thee; thou bringest light to that which is hidden, and thou art armed with learned weapons as is a hero for the strife." As a jurist Samuel is especially mentioned in matters relating to marriage laws. No separate work on Halakah is left by him; but his responsa on various questions are to be found in the works of others; e.g., Mordecai b. Hillel and Meïr of Rothenburg. For a long time Bamberg was supposed to have been the author of the "Liḳḳuṭe ha-Pardes"; Moses Isserles believed even that he was the pupil of Rashi. Eckstein has proven that these surmises are impossible; and Epstein has shown that the work comes from the school of Isaiah of Trani ("Monatsschrift," lxiv. 29 et seq., 53 et seq.). A few of his exegetical remarks are mentioned by later scholars also. His explanations of various parts of the Maḥzor are several times cited, and it is probable that he composed a commentary on this work, a copy of which is perchance in the library of David Kaufmann (Grätz, "Jubelschrift," p. 18). Characteristic of the man is his saying, "It is more praiseworthy to make a gift for the education of the young than for the keeping up of the synagogue," especially as Samuel was influential in the formation of the South-German ritual and was always anxious that the synagogue service should be carried on in an orderly fashion. Michael, Or ha-Ḥayyim, No. 1203.